Transparency Market Research has announced the publication of a new report on the global camera module market. The report, titled “Global Camera Module Market - Industry Analysis, Size, Share, Growth, Trends, and Forecast 2013 - 2019”, is available for sale on the company’s website. This report gives the readers a 360-degree view of the entire market and the factors that are influencing it in a significant way. The global camera module market is witnessing a radical change for the better, growing with every technological advancement. In the coming years, the global camera module market is expected to grow at a noteworthy rate due to the increasing usage of tablet PCs and smartphones, coupled with the growing demand for better pixel clarity. As more and more smartphone users are realizing the power of good phone cameras and the possibility of high-quality imaging through them, they are collectively changing the face of the global camera module market. In addition to this, the influx of mobile applications for social networking and communicating via email are also encouraging the growth of the global camera module market in direct and indirect ways. 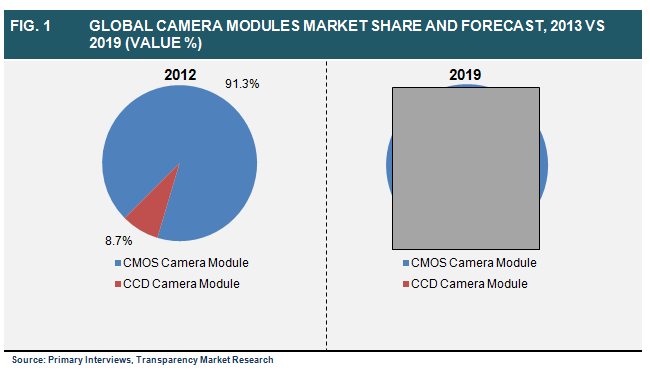 According to the report, the global camera module market was valued at US$12.0 billion in 2012 and is expected to reach US$43.06 bn by 2019, growing at a CAGR of 19.7% between 2013 and 2019. The global camera module market is segmented on the basis of types of sensors, applications, and region. The types of sensors in the global camera module market are CCD camera modules and CMOS camera modules. The application of camera modules is seen in consumer electronics such as smartphones and tablet PCs, the automotive industry, the medical industry, the industrial and security sectors, and the defense and space industries. Regionally, the global camera module market is segmented into North America, Europe, Asia Pacific, and Rest of the World. 2012 saw the smartphones segment account for more than 80% of the demand for camera modules. Analysts predict that the smartphones application segment will grow at a CAGR of 21.9% between 2013 and 2019. This incredible growth rate can be attributed to the increasing popularity of smartphones that are enabled with both front and rear cameras. As the Asia Pacific region has the maximum number of camera module manufacturers, this regional market will witness a prolific growth rate. It will continue its dominance in the global camera module market just as it did in 2012 with a market share of more than 60%. To give a fair assessment of the competitive landscape of the global camera module market, the report profiles some of the key players such as LG-Innotek, Liteon Chicony, Foxconn, STMicro, Primax, Truly,Fiberoptic, Cowell, SEMCO, Toshiba, Sharp, Sunny, KMOT, Samsung, BYD, and Vista Point. The profiles include company overviews, financial outlooks, investment plans, and their research and development status.